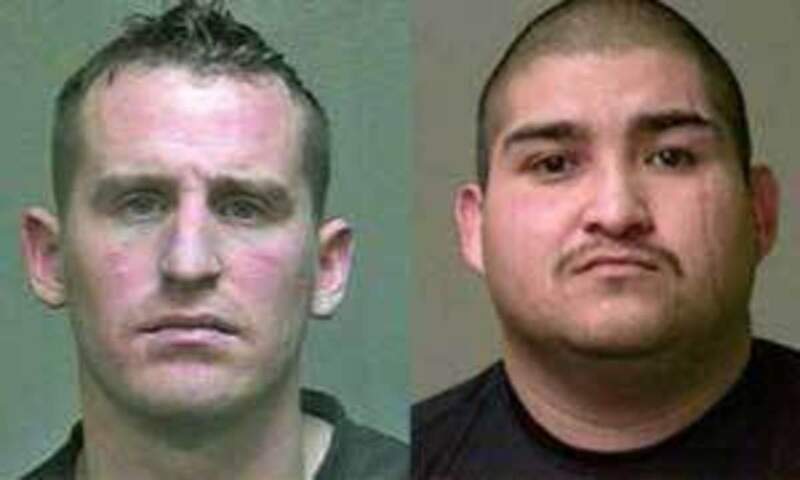 Oklahoma City, OK– Two guards at the Oklahoma County Jail were fired and charged with assault and battery of an inmate after attacking Cortez Meadows in front of their security cameras in December of 2013; a judge later dropped the charges. Now, Meadows has opted to release the footage of the incident saying that he wants the public to see what happened to him. Meadows was arrested for a false call to 911. Former detention deputy John Jacobson, 29, and former detention officer Jose Botello, 29, were both arrested last year as a result of an internal affairs investigation of the incident. It is unclear why the judge opted to drop the charges. In the video, we see Meadows cuffed and being taken into a cell. One of the guards kicks Meadows’ left side twice, causing him to drop to the ground. Jacobson then forces the man’s head onto the floor of the cell, which is soaked in urine. Botello is seen next punching Meadows on his right side. At this point, another guard enters to help move Meadows to another cell so that a cleaning crew can enter and mop up the urine. In February of last year, Cortez spoke to KOCO 5 News about his experience as the two guards took turns assaulting him. Meadows claims he is still unable to work due to injuries sustained during the beating and is planning to file a civil lawsuit against the two guards. Sadly, this is nowhere near an isolated incident and the stories of prisoner abuse are endless. In 1971, Stanford University conducted an experiment where 24 male students were selected to take on randomly assigned roles of prisoners and guards in a mock prison situated in the basement of the Stanford psychology building. This experiment was known as the Stanford Prison Experiment, and the results were shocking. “What happens when you put good people in an evil place? Does humanity win over evil, or does evil triumph? These are some of the questions we posed in this dramatic simulation of prison life conducted in the summer of 1971 at Stanford University. How we went about testing these questions and what we found may astound you. Our planned two-week investigation into the psychology of prison life had to be ended prematurely after only six days because of what the situation was doing to the college students who participated. In only a few days, our guards became sadistic and our prisoners became depressed and showed signs of extreme stress.” the website explains. At the conclusion of the study, it seemed that the situation, instead of their individual values, attitude, and morality caused the participants’ dramatic change in behavior.